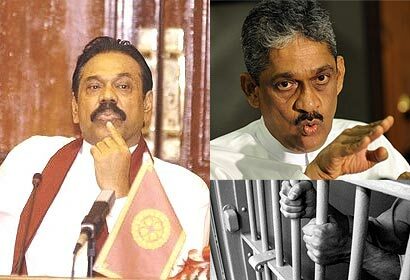 The verdict is due in the third and most serious case brought by Sri Lankan authorities against former army chief Sarath Fonseka. He is charged with “spreading disaffection” after he gave a newspaper interview apparently giving credence to allegations that the defence secretary ordered war crimes. Fonseka has said he was quoted out of context. He is already serving a two-and-a-half year sentence for corruption. Fonseka, 60, faces further charges, including one of harbouring army deserters. An ardent nationalist of the Sinhalese ethnic majority, he fell out with his ideological soulmate, President Mahinda Rajapaksa, shortly after leading the military to victory against the Tamil Tigers in 2009. He challenged President Rajapaksa in the presidential elections in November 2010 and suffered a defeat. In a newspaper interview he apparently gave credence to allegations that the defence secretary ordered the killing of Tamil Tiger leaders as they tried to surrender. On Friday three judges will pronounce their verdict – if found guilty he faces a possible jail sentence of up to 20 years.